5. When an acid (H-) is added to alkali (OH-), the product is ___. 6. The reddish-brown rust on iron roofing sheets consists of ___. 7. Which of the following metals will displace iron from a solution of iron (II) tetraoxosulphate (IV)? 8. The IUPAC name of the compound NaAlH4 is ___. 9. 2.5g of a hydrated barium salt gave on heating 2.13g of anhydrous salt. Given that the relative molecular mass of the anhydrous salt is 208, the number of molecules of water of crystallization of the barium salt is ___. 10. The type of bonding [Cu (NH3)4]2+ is ___. 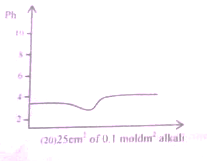 11.The curve above depicts titration between __. 12. Steam changes colour of anhydrous cobalt (II) chloride from ___. 13. The first metal used by man was __. 14. The forces of attraction that exist between non-polar molecules are called __. 15. Which of the following salt is used in the preparation of caustic soda, washing soda, hydrochloric acid, bleaching powder etc? 16. What volume of oxygen will remain after reacting 8cm2 of hydrogen with 20cm2 of oxygen? 17. During electrolysis of a silver salt, 10920 coulombs of electricity were passed. The number of moles of silver metal deposited is __. 18. What is IUPAC name of the compound whose structure is shown below? 19. An acid and its conjugate base ___. 20. A gas is contained in 0.050m3 under 8.104 x 105 Pa pressure at 293k. How many moles of gas are in the container? 21. Which of the following gases will rekindle a brightly glowing splint? 22. Which of the following mathematical relationship represent the first law of thermodynamics? 23. If d represents the density of a gas and k is a constant, the rate of gaseous diffusion r is directly related to d by the equation. 24. Graphite conducts electricity because ___. 26. The number of waves in n x 10th Bolur ‘s Orbit are __. 27. Which one of the following pairs of gases is the cause of occurrence of most of the explosion of mines? 29. Which of the following processes is Iron being oxidized? 30. The composition of gun powder is __. 31. 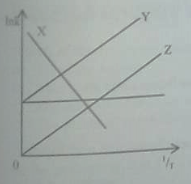 The graph above demonstrates the effect of ___. 32. In the Haber process for the manufacture of ammonia, the catalyst commonly used in a finely divided iron is used as ___. What is the corresponding valve of EO cell ? 34. The number of oxygen atoms on 0.5 mole of KHSO4 is __. 35. The alkenes form a homogenous series of saturated hydrocarbons. They have a general molecular formula of __. 36. Tin is unaffected by air at ordinary temperature due to its? 37. In an electrochemical cell, polarization is caused by? 38. PC I5(l) ⇋ PC I3(l) + Cl(2)(g) ΔH =+ve. In the reaction above, the forward reaction is favoured by? 39. On exposure to the atmosphere, a hydrated salt loses its water crystallization to become anhydrous. This phenomenon is referred to as__. 40. 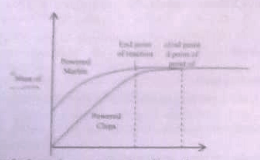 In the diagram above, which of the curves illustrates Arrhenius law?